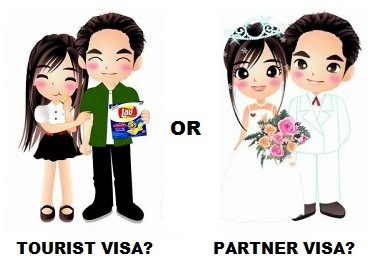 / Tourist visa or partner visa? The big question for Australian Filipina couples. The main thing I will put to you is this: If you are committed to each other, you should be looking at a partner visa. No question about that! The issue of “I just want to see if she likes Australia” is a non-issue, and has always been a non-issue. I have never come across a situation where a Filipina lady says to her man “You are the love of my life, but I don’t want to live in Australia. Goodbye forever!”, and then heads back to Manila. Yes, we come across relationships that fail, but not because Melbourne or Perth filled the lady with loathing. If she loves you, she wants to be with you and she will adapt! It’s not so hard anyway, is it? If you are committed to each other, and if you are both certain of each other, then bite the bullet and get on with it! Life’s too short to waste time being apart when you don’t need to be. I get this question every single week. “No, not ready for a partner visa yet”, they tell me. But they want a 12 month tourist visa so they can be together, and a 3 month stay isn’t long enough. I’ve already covered how hard it is, and how in most cases impossible, for someone to get a 12 month visa because who honestly takes a 12 month holiday? Wish I could! And the other issue being that tourist visas are not substitute partner visas. They design specific visas for specific purposes. Tourist visas are for people taking holidays, and partner visas are for couples who want to live together and don’t want to be apart. Apply for a visa for the wrong purpose, and the will refuse it. The other issue is that when someone indicates to me that they don’t want to be apart, either by trying to get a 12 month tourist visa or by asking about the next visa and how soon they can apply for it, it tells me that they may just actually be committed to each other! When is a tourist visa appropriate? If you are in the early stages of your relationship, and if you’re not 100% certain, and if you wish to develop your relationship further so you can see if you’re really compatible when you see each other every day, then yes…..a tourist visa is right for you. Absolutely. And if you or the lady are still married to someone else, and have divorces and annulments to be sorted out before you can apply for a partner visa to Australia, then yes again…..go for the tourist visa. Spend time together instead of apart. We’ll be happy to help you to get the application prepared and lodged properly so you get a visa grant instead of a refusal. Happy to oblige. When is a partner visa application appropriate? Easy! When you know that you’ve met the right one. And of course when you’ve met in person, which is a legal requirement for any Australian partner visa or prospective marriage visa. When you want to grow old with this person. When you want to make babies and raise families with this person. When you know you’ve found your best friend and lover all in one. Sometimes this happens quickly, and other times it slowly develops. Some people are very cautious and wary of making mistakes again. Others are more intuitive and trust their feelings even if it’s only early days. It’s an intensely personal thing. For me when I observe? It’s fairly obvious when a couple have clicked, and it’s pretty obvious when you know they can’t stand being apart. If these things happen? Then forget tourist visas. You can get on with this so you can get on with the rest of your lives with your Filipina wife by your side, or you can delay it and delay it with tourist visas. You will love your time together, then you’ll be all cut up when you have to stick her on the plane back to Manila. Why put yourself through this? You’ll be living the emotional version of living out of a suitcase for a long time if you delay the very obvious. Money! Yes, a partner visa costs. But if you want to be together, you need to open the wallet. No avoiding this. You’ll need to find that money anyway, and doing a head-in-the-sand thing won’t change reality.